From the usual Sambar and Rasam this is definitely a different, tasty and also a very simple dish to prepare . My Daughter loved it very much... and in her words yummy!!!!!!!! 2 cups of Basmati rice. Soak the chickpeas overnight or for 10 hrs. Cook the chickpeas with a pinch of salt and with sufficient water. Allow it for 3 whistles. Wash and soak the rice for 5 - 10 mins. In the cooker, heat oil / ghee. Add all the seasoning ingredients. Add the chopped tomatoes and saute them well. Add the turmeric powder, chilli powder , garam masala powder and saute them well on medium flame until the raw flavor extracts from it. 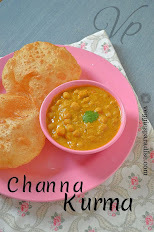 Now add the cooked channa to it and mix well. Finally add the rice with 4 cups of water along with salt. Allow it for 2 whistles. Looks delicious and a meal in one.Lovely. I agree with ur daughter..Looks YUMMY !!!. 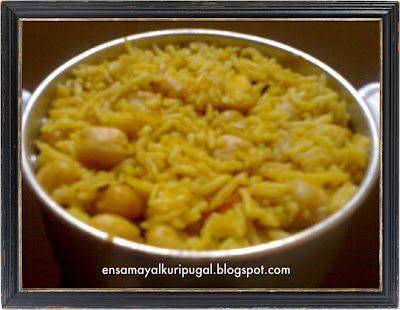 I love one pot meals anyways.. quick, easy and delicious..
Chana pulav looks delicious... Looks great..
A new interesting recipe. Pic looks tempting and irresistable. healthy n wholesome rice !! 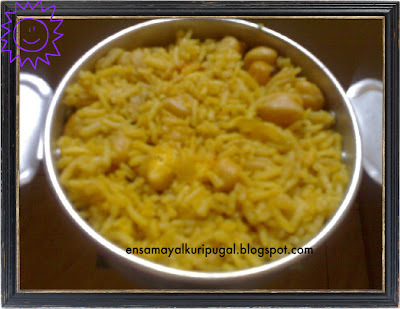 My all time favourite pulao.. Different & looks truly yummy!!!! !